Water is vital to our entire world but especially our bodies. Water helps to distribute nutrients and vitamins to cells, helps remove toxins from the body and aids directly in hair growth. Unfortunately, most people do not have the proper amount of water each day or are having a very hard time drinking. 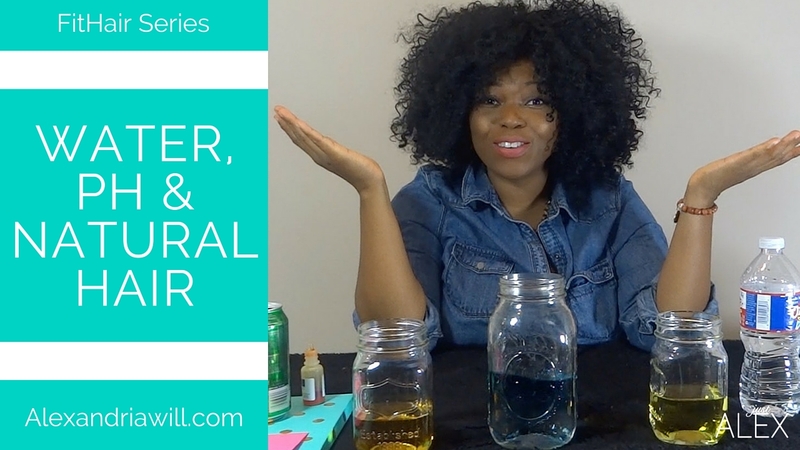 If you are having concerns about drinking water or need a reason to kick the soda habit, take a look at my water, ph and natural hair series for an eye opening segment focusing on water, ph and natural hair. This is the first video of the water, ph and natural hair series. Did you know your body tries to maintain a neutral balance of alkaline and acidity. Foods, water, alcohol and even stress can and does directly affects a person’s overall well being but also the pH levels. In this video I discuss the importance of water, education on ph and how water affects not just natural hair growth but internal organs, skin complexion and much more. Many studies suggest an acidic body is a magnet for sickness, early aging, various diseases and even cancer. Eating more alkaline foods helps shift your internal body’s pH and oxygenates your system. This means your body has more oxygen, which is something we breathe in every second of the day. Acidic items are needed such as our stomach acid in order to break down but to much acidic foods internally can hinder and alter our ph levels. Alkaline foods keep your body healthy and functioning correctly, preventing diseases and help with your overall well being. In this video, I discuss the differences in acid and alkaline and how it affects the over all well being of a person. Please note: I am mostly referring to basically alkaline and acidity levels with regards to foods and liquids. If you are not a DIY naturalista or want to see a ph chart here is a quick chart of acid and alkaline chart. Disclaimer: The information, including but not limited to, text, graphics, images and other material contained on this website are for informational purposes only. The purpose of this website/video is to promote broad consumer understanding and knowledge of various health topics. It is not intended to be a substitute for professional medical advice, diagnosis or treatment. Always seek the advice of your physician or other qualified health care provider with any questions you may have regarding a medical condition or treatment and before undertaking a new health care regimen, and never disregard professional medical advice or delay in seeking it because of something you have read on this website. JustAlex/Alex Williams does not recommend or endorse any specific tests, physicians, products, procedures, opinions or other information that may be mentioned on this website. Reliance on any information appearing on this website is solely at your own risk.